I sit here two months too early anticipating what I will plant and where. 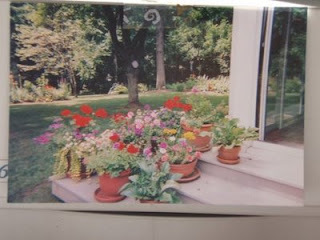 Taped to my printer is this photo of part of last year's planting -- my 'stepscape'; it makes me feel better. Forgive the poor quality; it's a photo of a photo. Last night's dinner was supposed to have been Turkey Puttanesca -- a recipe I 'cooked up' a while ago, but time got the best of me and we wound up carrying-out a couple of sandwiches. I'll be cooking the puttanesca tonight. 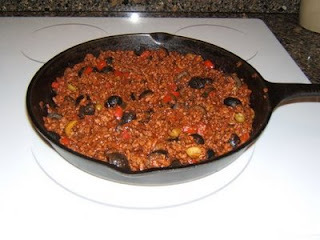 Some of you may have enjoyed spaghetti puttanesca -- (this means old whore -- probably a reference to the dish's spicy, peasant origins) -- a tomato based sauce with olives, capers, and red pepper flakes. This recipe is my take on that, with a nod to the Greek dish, pasticcio. Saute onion and pepper in oil in large frying pan. Add ground turkey and cook until browned, breaking up large pieces while cooking. When turkey is sufficiently browned, add tomato sauce, salt, pepper, cinnamon and cloves . Stir well and simmer for ten - 15 minutes, adding water or chicken stock if too thick. Add olives. Taste for seasoning and adjust if needed. Lightly stir in capers; heat to warm. I serve this over brown rice, but white rice or pasta would be great. I so much want to start planning my garden, but I don't have time now. Maybe in a month. Your turkey puttanesca looks very good!!! I want to make turkey puttanesca...just so I can say the name. Well, it does sound good too. Your garden is lovely. I can't wait for spring! I'm right behind you, Ginni!!! C'mon spring! !